Official word of the next generation BlackBerry Bold is finally here. 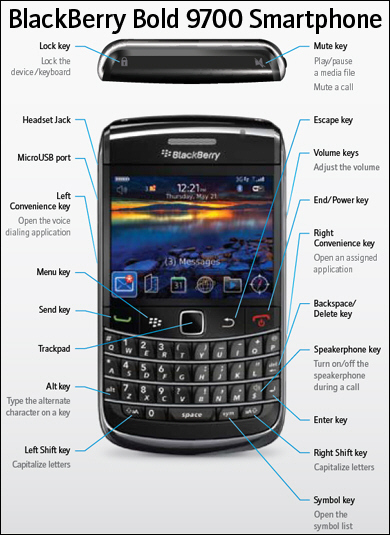 Below you can find the full specs and features list for the new BlackBerry Bold 9700 Smartphone. And be sure to check out our pre-release BlackBerry Bold 9700 Review which goes hands-on with some of the enhancements made to this smaller, yet more powerful, BlackBerry Bold. Full-featured phone Have the features of a desktop phone with you when you're between appointments or running late. Designed to take advantage of the speeds available on 3G networks. Chat from just about anywhere using Windows Live Messenger, Google Talk, Yahoo! Messenger, AOL Instant Messenger or ICQ apps built specifically for BlackBerry smartphones. Chat from just about anywhere using Windows Live Messenger, Google Talk, Yahoo!® Messenger, AOL® Instant Messenger or ICQ® apps built specifically for BlackBerry smartphones. Designed to work with BlackBerry Maps and other location based software, use it to help determine where you are and how to get where you need to be. A dynamic browsing experience, to help you get the information you need, when you need it. With the BlackBerry® Browser, you have easy access to the Internet with web pages that are easy to navigate and read. For small to medium-sized businesses, Hosted BlackBerry® services and BlackBerry® Professional Software are designed to offer affordable solution options. For large organizations, BlackBerry® Enterprise Solution is designed to provide advanced security features and enterprise-grade functionality..